Live Green, Wear Black. : First CSA Box! 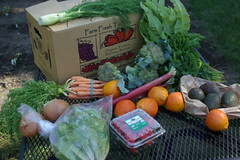 Today I recieved my first CSA delivery from Farm Fresh to You in Capay Valley. The newsletter was great -- it talks about our new best friend: Aphids. They've been a problem all over the place, apparently. I learned that Aphids especially like chard. My chard are barely germinating so hopefully the ladybugs will get the aphids under control before they start developing more. Today I came across a blog review of different CSAs -- it makes me think that perhaps I need to give this one a trial and check out some others. For $29, I admit I did expect a bit more produce though they do deliver it right to my door.